In honor of Reformation Day I’m re-posting a classic article from 2 years ago explaining the importance of this under appreciated holiday. This is one of my all-time most popular posts so I hope you’ll enjoy! 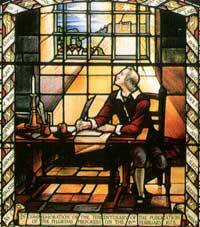 The spark of the revolution began with the posting of the 95 Theses. The fires were kindled with his defiant words at Worms. 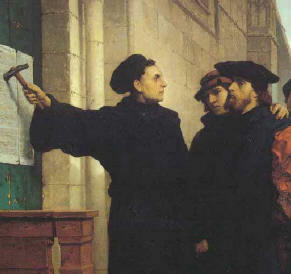 The Protestant Reformation began in earnest in 1521. The word protestant simply means protester. A protestant opposes the false teachings of Roman Catholicism. This one and firm rock, which we call the doctrine of justification, is the chief article of the whole Christian doctrine, which comprehends the understanding of all godliness. Sola Gratia – God’s loving and compassionate grace to lost sinners saves us from his fierce wrath. This grace is not based on any goodness within ourselves. His grace is according to his good pleasure and his purpose. God is not obligated to save one single soul. If he were to send all of humanity to hell he would be just in doing so. However, God in his mercy has bestowed grace upon man, giving every person opportunity to repent of his sin and embrace Jesus Christ as Lord and Savior. Believers are ‘… justified by his grace as a gift, through the redemption that is in Christ Jesus’, (Rom 3:24) Only by God’s loving grace is salvation made possible to the human race. Sola Fide – We are saved through faith in the Lord Jesus Christ. We trust his sacrificial death on a cross has washed away our sins and redeemed our souls from death, hell and the grave, forever. This faith is a gift of God’s grace. It is not of ourselves, lest any man should boast in his salvation. Faith needs no help to make it complete. Our good works do not alter our standing before God. The Apostle Paul wrote, ‘For we hold that one is justified by faith apart from works of the law’. (Rom 3:28) We are saved by faith alone. Solus Christus – The Son of God clearly named the narrow road that leads to eternal life. it is called Jesus Christ Boulevard and it is clearly marked by his stripes and paved with his blood. He claimed, “I am the way, the truth and the life. No one comes to the Father except through me.” (John 14:6) The Apostle Peter proclaimed, “And there is salvation in no one else, for there is no other name under heaven given among men by which we must be saved.” (Act 4:12) We are saved by Christ and no other. Sola Scriptura – The truths we adhere to have been graciously given to us in the form of the holy bible. It is a testament of God’s people throughout the course of human history, detailing the account of man’s fall and redemption through Jesus Christ. No other source is authoritative in establishing Christian doctrine and practice. “All Scripture is breathed out by God and profitable for teaching, for reproof, for correction, and for training in righteousness, that the man of God may be competent, equipped for every good work.” (2Ti 3:16-17) The revelation of scriptures alone through the illumination of the Holy Spirit shall lead us to all truth. Soli Deo Gloria -The deeds of the saints, the wicked and all the host of heaven are ultimately accomplished for the glory of God. Believers glorify God by displaying His attributes of love, grace, mercy and compassion. The reprobate glorify God by displaying God’s equally glorious attributes of wrath, righteousness and justice. The contrast between sin and righteousness magnifies the holiness, purity and majesty of Almighty God. Jesus came to glorify the Father and in return the Father glorified him. The author of Hebrews wrote of Christ, ‘He is the radiance of the glory of God and the exact imprint of his nature’, (Heb 1:3) The chief end of man, according to the Westminster Shorter Catechism is to ‘glorify God and enjoy him forever’. Psalms 79 states ‘Help us, O God of our salvation, for the glory of your name; deliver us, and atone for our sins, for your name’s sake!’ (Psa 79:9) Let nothing we do or say be done for our glory or for the glory of others, but for the glory of God alone. In summary, the Reformation sparked by Martin Luther taught us that God justifies the guilty by Grace Alone through Faith Alone in Christ Alone according to the Scriptures Alone for the Glory of God Alone.